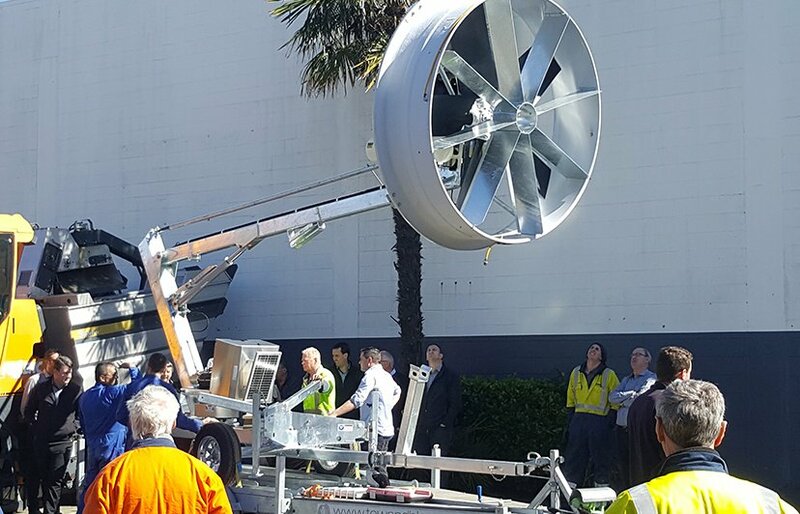 Tow & Blow; the first truly portable Wind Machine; has been developed by NZ’s foremost expert in the Wind Machine industry. 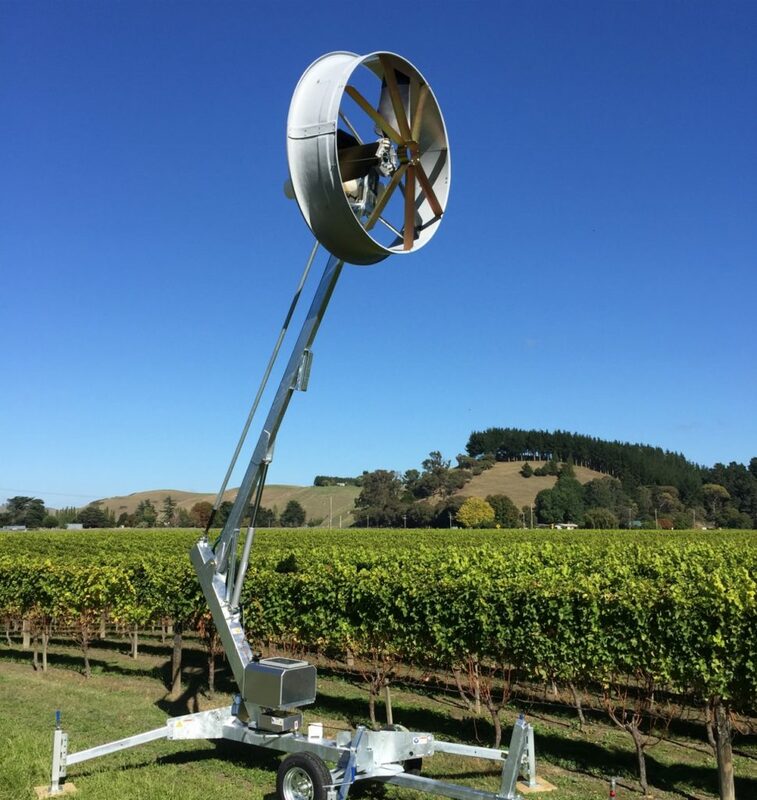 In the early 1990’s after returning home to NZ from living in the USA for 8 years (where he studied the use of Wind Machines for frost protection); kiwi engineer Kim McAulay began importing US Wind Machines into his home country. It didn’t take long for Kim’s creative instincts to kick in for him to design his own Wind Machines. The “Frost Boss” is now well known throughout the world for its innovation. Kim sold “Frost Boss” in early 2000’s. But the giant of the Wind Machine industry couldn’t sleep!! He had learned so much during those 25 years, and he knew he could take all of the problems and issues that have emerged over time with Wind Machines and develop something that over comes them all. The Tow & Blow is now presented to you as the culmination of those years of experience. The biggest issue that Kim identified was the inefficiency of the current machines. The inefficiencies came about for safety reasons. Wind machines had moved away from having their engines on top of their tower (only accessed by climbing the ladder some 30 odd feet up) to being ground powered. Large diesel engines mounted on the ground driving through clutches, gear boxes and long drive lines powered the fans. This wastes an enormous amount on energy, uses lots of fuel and is very expensive to maintain. The Tow & Blow is a portable and extremely affordable wind machine. Which is highly effective in combating freezing temperatures, or frost, as well as soaring temperatures and the associated sunburn in plants. It is a highly adaptable wind machine that can be used in valleys as well as hilly terrain, and it can be easily relocated. Tow and Blow has unparalleled advantages over traditional tower fans. The unique straightening vanesallow the air to exit the fan without spiral motion therefore maximising the directional momentum of the airstream energy. Tow & Blow also blows away from the machine without obstructions. The Impeller is a high performance composite fan with optimised pitch for maximum airflow. The Tow & Blow uses a 23.4HP Kohler Diesel liquid cooled engine with direct drive to the fan through a heavy duty planetary gearbox. It only uses a mere 5 litres of diesel an hour compared to traditional tower fans that consume 25 litres an hour! Noise level is the quietist of any frost fan on the market today! No unproductive land site is required for a foundation and machine access. The Tow and Blow can be positioned within the row. A traditional four bladed ground power wind machine is generally advertised as 150hp at 2500 RPM. However, these machines only run at 1750 RPM leaving just over 100 hp at the fly wheel. Traditional tower fans then have to send this power through a clutch, a right angle gear box, then up 30 odd feet of drive shaft, then through a 96 degree top box with rotation worm drive. This leaves only about 70 HP available to spin the fan. Traditional Tower with open style fan is generally 5 meters in diameter. 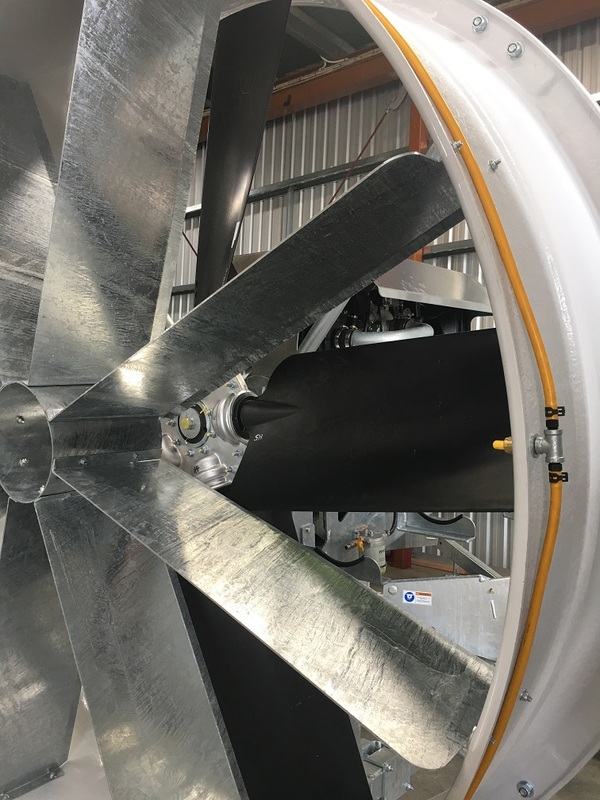 As it is un-shrouded the open fan creates an enormous amount of drag consuming a large percentage of the HP most likely leaving only 30 to 40 hp to generate airflow for frost protection. All Traditional Tower Fans blow against the tower as it rotates further reducing HP. We calculate that the final result is approximately 20 hp of useable power. Reports published on traditional tower fans claim to move 19 m/s of air. This is only at one point on the fan where it blows directly over its own tower as it rotates. OPUS reports show the true velocity of air to be 12 m/s of air averaged across the blade. This doesn’t take into account the loss of velocity and volume of air caused by the obstruction of the tower. The tests were all done in an unobstructed environment with no duct or shroud.